We went to meet a bunch of the childrens' friends at a local park the other day. It was a warm, sunny afternoon so the park and play areas were swarming with kids, many of them riding bikes. 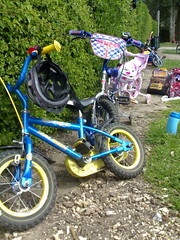 There didn't seem to be the same penetration of bikes into the older groups of children. This got me thinking-At what stage in a child's development does cycling start to become less frequent, and why? My sunny-day-at-the-park sample is fundamentally flawed, but bike usage seems much higher in early years (say 3-6) than it is later in childhood and adolescence. There seems to be a strong correlation between leisure activity and cycling in early years (Mum & Dad taking a child's bike to the park) which isn't strongly carried through into utility transport in later years. You don't see so many kids going to Saturday morning football/swim class etc on a bike, or cycling to school, and I'd bet that fewer families go for bike rides together than take their young children to the park with their bikes. Factors like increased distance, changes in environment from park to road, perceptions of danger, fashion and increased complexity of journeys all play a part, but in the end what's lacking is the perception of bikes as a real, practical means of independent transport rather than a just another toy to compete with the playstation. 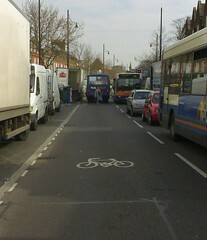 This perception gap is key to getting more people on bikes- and it needs to be addressed early. Liz Bowgett, a teacher from Newham, for example, took it upon herself to get more children in her school on to two wheels. After announcing plans to launch a programme to give children some basic bike training, she found she was oversubscribed three times. Within a few months, she was managing a full-scale project: organising mass bike rides, building storage facilities for bikes at the school and buying a trailer to transport bikes for trips away, as well as buying second-hand bikes for those children who didn't have their own. This is a great example of grass roots work on cycling, building and maintaining interest in cycling through enablers and involvement, linked into the school curriculum. It's the way forward if we want to build cycling locally, but this example clearly shows it won't happen by itself...this is where local cycle campaigns come in! Read more about Liz's sucess in ceating New City Cycling club on the London Cycling Campaign website , at the safe routes to schools site here and at Newham Council's website.